When the Detroit-based, Lansing, MI formed Universal Nubian Voices (U.N.V.) first hit the scene in 1993 with their Top 30 Pop, Top Five R&B hit “Something’s Goin’ On” (peak #3 R&B/#29 Pop) it seemed they were ready to take the world by storm. As the first R&B act signed to Madonna’s then-new Maverick imprint for Warner Bros. Records, it appeared the MotorCity quartet was on their way to give similar groups of the period like Shai, Intro, and Portrait a run for their money. Their follow-up single, “Straight From My Heart,” was a personal favorite, even more than their national debuting hit, though it eventually stalled at #36 on the R&B charts. A follow-up 1995 album, the self-titled Universal Nubian Voices, quickly crashed and burned despite top producers behind the boards, leaving only a Top 50 R&B single as its legacy, the wedding ballad “So In Love With You.” Already battling with the label over musical direction, the group left Maverick shortly after the sophomore album’s release and broke up a year later. And, while that could’ve been the end of yet another Black quartet in the crowded dustbin of R&B history, one of its lead singers and founding members, J. Poww, decided he wasn’t quite ready to exit the stage. 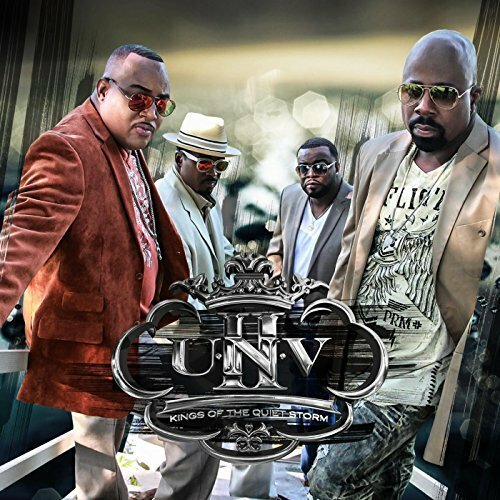 With the Kings of the Quiet Storm (Powwer Moves Records), the second independent project of the newly re-cast U.N.V., with Poww at the helm, makes a fairly solid case for why this now veteran brand deserves another round or several at gaining some glory. U.N.V. never had a problem in the vocal department, though no one is likely to be able to pick-out a particular standout singer from the group by name. Brothers John and Shawn Powe and members John Clay and Demetrius Peete could all blow in the style of the times. Relative newcomers Terry Thomas, Byron “Suge” McClendon, and Jeff “JAS” Stuart continue that tradition, each coming out of the world of gospel and excelling at executing powerful, authoritative harmonies and robust leads that can be easily traded off among the fellows without ever missing a beat in quality or passion. Arguably, U.N.V. II are superior vocalists to their younger iteration, with the exception of some questionable falsetto work on the otherwise swinging mid-tempo groove, “Baby You Are.” These are older men and their voices bear the weight of their experience in all the right ways. Their perfect blend is especially notable on bright bulbs like “Sunshine,” which interpolates Dynasty’s well-worn horn sample from “Adventures in the Land of Music” (to be fair, it’s used so much because it never fails to work, this cut being no exception). Steppers will be pleased to find a fun song catering to them, “Wanna See You Dance,” one that allows grown folks to get out and hand dance like their parents taught them a generation or two before. Where the work struggles a bit is in the areas that U.N.V. has always seemed to struggle: having material and production consistently at the level of their vocal talent. The album keeps it consistently old school in a 1990s smooth soul direction, and it is highly listenable as mature R&B of a kind that is often missed. The project’s Quiet Storm motif plays to the group’s strengths, giving the men plenty of opportunities to show off their ample chops and is a project that can be played straight through without skipping any tracks. But, as with “Bad Case,” “Running,” “and “Take You Out Tonight,” songs often go on longer than they should, starting impressively with a catchy melody and memorable sample, but wearing out their welcome with repetition, a lack of originality, and a failure to ever surprise in arrangement or composition. It’s safe, by-the-numbers R&B production of a bygone era. Luckily, there is a market for that right now, especially with singers this strong. And, with a lot of New Edition nostalgia in the air for ‘90s era smooth soul, U.N.V. might finally have found a sweet spot where worthy talent meets timing and opportunity in a way that finally gives these Nubian Voices their place in the sun. Recommended.